One of the ways we LOVE GOD, SERVE OTHERS AND BUILD SACRED COMMUNITY is through the variety of our dynamic ministry teams. We have numerous areas for each person to use their specific gifting's and live into their passions. If you're interested in preparing and cleaning up refreshments such as coffee, tea, water and snacks during our Sunday morning fellowship hour (before, between and after services) then this may be just the team to join in a rotation or just a one time event. Contact Carianne Short for more info. If you enjoy meeting new people and seeing familiar faces, while also helping people feel welcomed and providing direction and answers to questions, then volunteer in a rotation or just once in while. There is a sign up in the Fireside room . If you're interested in greeting people at the doors to the sanctuary each week with our weekly newsletter and bulletin and then helping collect the offering, then being a volunteer on a rotation with the ushers team might be the place for you. Contact Pastor James Preston for more info. 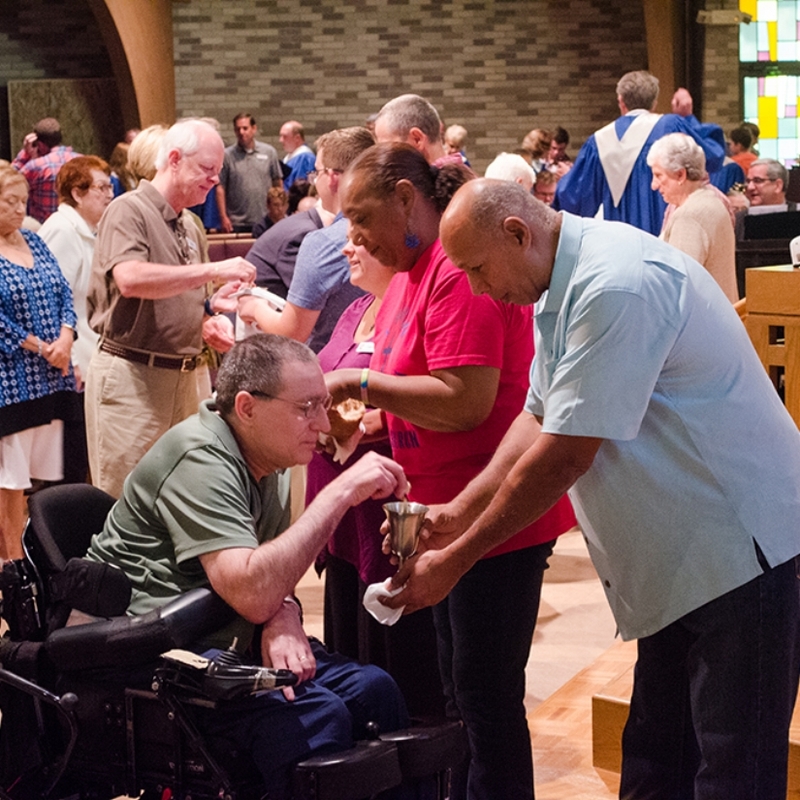 If you're interested in serving communion through intinction, which is the Eucharistic practice of partly dipping the consecrated bread, or host, into the consecrated juice before consumption by the communicant you can sign-up here. If you are interested in connecting with others, or if you would be interested in coordinating a one time event or an ongoing group that will help connect people to one another then this ministry might be a great way to get involved. Contact Barb Symonds for more info. If you enjoy working with junior or senior high youth than there are several opportunities for you to do so. You can be an adult chaperone on our annual mission trips and/or teach Sunday school and/or help with youth group. All of our volunteers are required to have a background check. If you're interested in learning more about our youth ministry you can go to our youth page and or contact our Minister of Youth Ministry. The pew restocking volunteers help straighten and restock the pew pockets. Volunteers are be responsible for one day a week per month between the hours of 9:00 am and 3:00 pm. Contact Flora Dierbach for more info. Contact Anton Obrecht for more info. The landscaping around the church has been divided into areas and weed-folks need help in keeping each area weed free. If you choose to adopt an area, weeding can be done when it fits into your schedule. Contact Sue Entwistle if you are interested in helping.